Per Le Figaro, Saturday/Sunday, the week of Fooding will occur 28 Nov to 5 December in "secret places," such as the heart of the Marais, the 30th, with folk from the hotels/restaurants Bristol, Meurice + Crillon and the man of the hour (except for Alain Senderens and Pierre Gagnaire) - Yves Camdeborde. Check it out here. 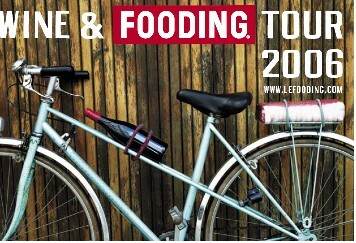 There are still two more Fooding "Wine and Food" events left before the Week of Fooding starts November 28th. The next one features tripe tapas with dry white Bordeaux Monday, October 17th at R. in the 15th with chef Stephane Jego - formerly Yves Camdeborde's "right hand" man - currently at L'Ami Jean. The password for the event will be posted 4 days before the event. The final one's Monday, November 7th with 99 Moet & Chandon Champagne and food by Nicolas Vernier chef/owner of Michelin one-star Caffe Minotti - modern French/Italian. Location and password still a secret. For the Week of Fooding events check the website on November 28th - it will re-launch with new secret locations and passwords. Last year Yves Camdeborde did a ephemeral restaurant in a boucherie each night - reservations were taken each day via a linked website only. 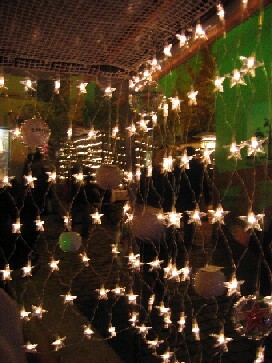 This year there will be a "semi-clandestine bar" with cocktails and "experimental tapas". Good luck! The main Web site for Le Fooding has been updated to provide full information for the upcoming/current week of events that begin on Monday, November 28. Each day's schedule is provided when you click specific dates. Is anyone going to attempt getting in to any of the fooding events? I may try to go one night, but I haven't had much luck in the past. "not much luck" in the past...do you think it's not worth going? I'm considering it, but yours isn't a ringing endorsement. Can you or anybody tell us more about these events? If you do a search you'll find lots of members have posted on it. I definitely think it's worth going to, it's just not that easy to get in. I’ve tried to go twice, without success. The first time was for one of their cocktails at the Palais de Tokyo. I ended up waiting in a line that didn’t move for about a half-hour and decided that, assuming we ever got in, it would be too crowded to be any fun, so my friend and I opted for dinner instead. The next event I attempted to attend was the BBQ this summer, which I’m sure would have been a lot of fun (Pitipois posted some great photos and there was a link to them in one of the threads we had at the time). Unfortunately, just as I arrived it started to storm quite violently and I’m not very fond of lightening, so as much as I wanted to stay, I just couldn’t. I will definitely try to go one night this week, probably tomorrow night. Hopefully the cold will keep people away. Can you or anybody tell us more about these events? Well, after two other attempts I was finally able to get into a Fooding event last night and was so happy I did. It was great. 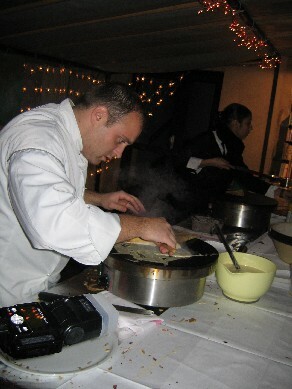 The chef last night was Yannick Alleno of the Meurice and the theme was “reinventing grilled chestnuts, crepes and hotdogs”. I’d say he did a pretty amazing job. We had delicious crepes with three kinds of fillings: chocolate, strawberry or vanilla; a wonderful foamy soup of chestnuts and fennel; the hotdogs were boudin noir on a pain de mie bun with some sort of mayonnaise and an apple ketchup washed down with two different artisan beers; pita bread with grilled lamb, a roasted pepper butter and shaved artichokes; pasta stuffed with duck and mushrooms to which you could add your own spices by wandering through a bunch of dangling spice shaker balls. The chef could be seen going from station to station making sure everything was going well. Champagne was served in funky rose-like glasses. I''m only sorry that I didn''t have my camera for photos. A VERY fun night! So fun, that I am going to try again tonight. I went to the Fooding festival again last night and the chef was none other than Yves Camdeborde. It wasn’t noted anywhere, but he could be seen racing around from stand to stand. The theme was once again “cuisine de la rue” and Mr. Camdeborde’s interpretation didn’t disappoint. I don’t remember every ingredient as it was not marked as it had been the night before, so forgive me if I get anything wrong. The “hotdogs” were boudin blanc this time, with some sort of artichoke spread; delicious sandwiches of veal tongue with capers and an ingredient I can’t recall; an amazing chestnut soup with tapioca, ladled over crème chantilly with peanuts and piment d’espellette; pasta filled with duck confit and do-it yourself spices, crepes for dessert and the same rose-like flutes of champagne and artisan beer to wash it all down. I took a few photos, but they didn’t come out all that well. Checked out the LeFooding website to learn about future events, but none seem posted. How frequent are they? Based on the past schedules, are they likely to have anything in early March? I will post them in the events as they come up. In the past they have had them every month or so, but the monthly events seem a lot more crowded and therefore difficult to get into. For those interested in the Fooding movement, there is an article by Rosa Jackson in this week’s Expatica on the subject. In addition, past threads of interest include these: 1, 2 and 3.
years ago--maybe in 2002 or so--le fooding had a week of soups of the marche. throughout paris one day would be devoted to one star chef and one market. 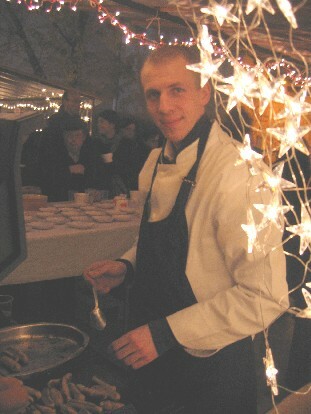 the chef would prepare a yummy soup from the seasonal produce and the punters would eat. i enjoyed a salt cod and potato soup at marche st quentin, served by by yves camemborde. and a mushroom and peanut soup, at.......i forget exactly where. but it was an alain passard soup, and i might forget where, but will never forget the flavour and depth it had. it was such a lively event, so excited, about food, about soup, about chefs, and markets, and......really lovely. they put the recipes on the website afterwards; the event was in conjunction with 10 a day (fruits and vegetables, a gov body set up like the uk's (now defunct) five a day). They've got it online now. Yes, I did. I'll take a look to see if it's the same as the online copy. Last time the print version had more articles than the online, so you may want to get it anyway. I missed out on Gagnaire, Ledeuil, Inaki and Marx... anyone got pics? Oh no, why didn't you go? Yes, I have photos and will post them soon. You can take a look at my blog but sorry, there aren't many pics, my digital camera ran out of gas much too soon. The first "Wine and Fooding Tour"of the rentrée is tonight at L’Alimentation Generale in the 11th. est un rocker à suivre. These do sound like fun. I'll have to be more careful about planning my next trip to coincide with one. Felice, how do you learn the password?